Because of Lebanon's unique geography, both summer and winter sports thrive in the country. In fact, during autumn and spring it is sometimes possible to engage in both activities on the same day; for example, skiing in the morning and swimming in the afternoon. In 1959, Beirut hosted the third Mediterranean Games. Lebanon hosted the Asian Cup in 2000 and the Pan-Arab Games in 1957 and again in 1997. In December 2011, Lebanon gained acceptance to host the 13th Pan-Arab Games in 2015. Although the Asian Winter Games were under consideration to be held in Lebanon in 2009, they ultimately did not take place. 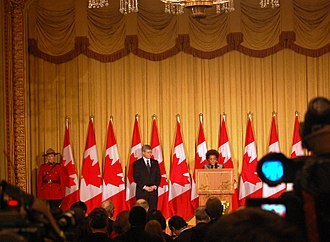 However, Lebanon did host Les Jeux de la Francophonie in 2009. Rally of Lebanon, which is organized by the Automobile et Touring Club du Liban (ATCL), has been a popular sport in Lebanon since the late 1960s. It is the only tarmac rally of the MERC. In 2001, Solidere revealed plans to build a racing circuit in the Beirut Central District in a bid to stage Formula One races in Lebanon. The plan was to make the Beirut Formula One the only in-city Grand Prix outside Monaco. The plans never saw fruition. However, Lebanon entered the world of international motor sport in 2004 with the formation of the Lebanese A1 Grand Prix team that included driver Basil Shaaban, making Lebanon the first Arab nation to participate in the World Cup of Motorsport. Jogging is a popular sport, especially in the capital along the Corniche Beirut, in the Horsh Beirut and the Shoreline Walk in Beirut Central District. Outside Beirut, jogging is practiced at the Marina Joseph Khoury in Dbayeh and along the corniches of Tripoli, Tyre and Sidon. The Beirut International Marathon (BIM) has been an annual, international event since 2003. It is held every fall, drawing top runners from Lebanon and abroad. Shorter races are also held for youth and less serious competitors. Race day is promoted as a fun, family event, and it has become a tradition for many to participate in costumes or outlandish clothing. Bodybuilding is a popular sport in Lebanon. 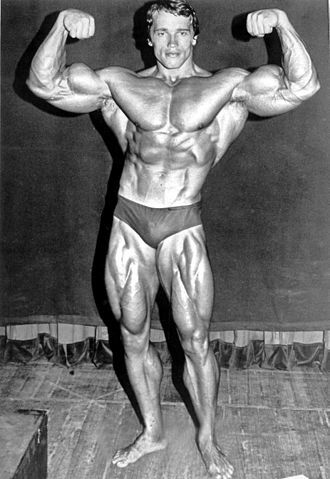 Bodybuilders like George Farah, Samir Bannout, Fouad Abiad and Mohammad Bannout, won international competitions. Edward Michel Kaouk was another Lebanese bodybuilder who won the Championship of Arabs and the Middles East in 1979, the Paris Amateur Bodybuilding Championship in 1980, and the World Amateur Bodybuilding Championship the same year. Malih Alaywan, IFBB Patron and once IFBB's vice president for the Middle East and, is credited with creating support for bodybuilding in Lebanon and the Arab world. Khalil Taha was a bronze medal winner in the 1952 Helsinki Olympics in Greco-Roman wrestling, while Zakaria Chihab won the silver. In 1980, Hassan Bechara won the bronze medal at the 1980 Summer Olympics in Moscow. Martial arts are also popular combat sports in Lebanon. Hiking, trekking and mountain biking are popular sports in the summer when ski lifts can be used to access some of Lebanon's best trails, with panoramic views stretching as far as Cyprus to the west and Syria to the east. 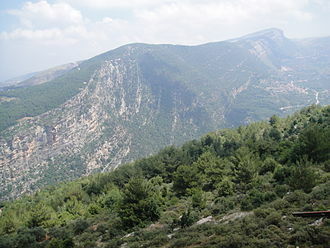 The Lebanon Mountain Trail is Lebanon’s first national long-distance hiking trail that covers 440 km and passes through 75 villages, starting in the north and trecking over the spine of Mount Lebanon until it terminates in the south of Lebanon. The Baskinta Literary Trail, a 24-km long, offers hikers a chance to discover 22 literary landmarks related to several acclaimed, Lebanese literary figures. Cross-country running, rock climbing, and caving are also sports practiced across Mount Lebanon. According to the 13th century French tale, L'histoire d'Apollonius de Tyr, the Stoic philosopher and Phoenician king, Apollonius of Tyre was the oldest tennis player and champion on record, albeit fictional. In reality, Lawn tennis did not come to Lebanon until 1889 when it was first introduced in the village of Brummana. Ainab was also one of the first villages in Lebanon to have a tennis court, which was built by five professors from the American University of Beirut early in the 20th century. The annual tennis tournament, which was an international event prior to the war, but now mostly a national one, is held at Brummana High School in August. Football is one of the most popular sports in Lebanon. In association football, the main federation for Lebanon is the Federation Libanaise de Football. The top division of football in Lebanon is the Lebanese Premier League. Twelve teams compete. The lexicons of football in Lebanon are Beirut clubs Nejmeh and Al-Ansar. The lower division is the Lebanese Second Division. Cup competitions include the Lebanese Elite Cup, the Lebanese FA Cup, Lebanese Super Cup and the Lebanese Federation Cup. Lebanon also got so many famous footballers and managers outside of this country. The Brazilian legendary manager Mário Zagallo, who brought the 1970 FIFA World Cup trophy to Brazil, is a half-Lebanese. So many famous people also played for the other nations such as Pierre Issa of South Africa, Faryd Mondragón of Colombia, Ahmad Elrich of Australia or newly Miguel Sabah and Miguel Layún of Mexico, both had Lebanese ancestry. Basketball is one of the most popular sports in Lebanon. In basketball, the main federation is the Lebanese Basketball Federation it's a member of FIBA Asia. The first time basketball was played was in the mid 1920s. The Lebanon national basketball team has qualified three consecutives times to the FIBA World Championship in 2002, 2006, 2010 and ranked 24th in the world and the women national team is ranked 61st in the world. Lebanon owns its own basketball league: Lebanese Basketball League for men and women in addition to the Lebanese Basketball Cup. The most successful Lebanese basketball clubs are Sporting Beirut and Sagesse for men and Antranik SC for women. The Lebanese play mini football which is very similar or identical to futsal. The Lebanon national futsal team represents Lebanon in international futsal competitions and is controlled by the Futsal Commission of the Federation Libanaise de Football Association. It is one of the rising teams in Asia. In December 2007, Lebanon ranked 34 in the Futsal World Ranking, the sixth highest ranking Asian team that year. In 2010, Lebanon ranked 41 and in 2011, the country ranked 48. Rugby league is a popular sport in Lebanon. The Lebanese Rugby League Federation is based in Safra in Lebanon. They are Full Members of the Rugby League European Federation and also Full Members of the Rugby League International Federation. The Lebanon national rugby league team qualified and played in the 2000 Rugby League World Cup, and nearly qualified for the 2008 Rugby League World Cup, but were narrowly beaten by Samoa in their final game. In 2011, Lebanon again nearly qualified for the 2013 Rugby League World Cup but lost to Italy who became the 14th and final nation to qualify for the event. In 2015 however they finally qualified for the 2017 Rugby League World Cup, for what was just their second World Cup, after beating South Africa 2-0 in a 2-match qualifying play-off held in Pretoria. The Lebanon Rugby League ("LRL") National Championship is the leading domestic rugby league competition in Lebanon, and consists of 4 clubs (Tripoli City RLFC, Immortals RLFC, Jounieh RLFC and Wolves FC). The second tier of competition, known as the Collegiate Rugby League ("CRL") National Championship, consists strictly of teams representing Lebanese universities and institutes of higher learning. The CRL is divided into two Divisions based upon longevity & success of the institution's Rugby League programme, and the CRL: Playoffs converge into a single CRL Finals Series. Rugby League is popular amongst Lebanese schools, with regional Schools Rugby League ("SRL") championships held in "North Lebanon" and also in "Beirut & Mount Lebanon" regions, where the winners (aka: "Premiers") of each region face off to be crowned the "National Champion"; contested at both U14s and U16s level. Lebanon has also sent schools to compete in regional international schools tournaments, and has hosted junior international sides from throughout the Middle East/North Africa region. Rugby union in Lebanon dates back to the French colonial period. Touch Football is a popular sport in Lebanon. In 1998, Lebanese Australians founded the Lebanon Touch Football Association. Since Lebanon's international debut in 1999 they have qualified for the 1999 World Cup in Australia where the Men's O30's won silver, Mixed Open won bronze and Men's Open came 5th. In the 2001 Youth World Cup in New Zealand the Lebanese Men's U18's team finished 4th and Men's U20's came 6th. In the 2005 Youth World Cup in Australia the Men's U20's defeated South Africa to win the bronze medal. In the 2007 World Cup in South Africa the Men's Opens team defeated Japan to win the bronze medal. Lebanon is currently ranked third in the world behind Australia and New Zealand. Volleyball has some popularity in Lebanon where there is a professional volleyball league. This team sport was introduced to Lebanon through foreign schools after the First World War in 1918. In the 1920s, it spreads widely in some schools, namely the Sacré Coeur, Al Makassed and La Sagesse and in some universities such as the Saint Joseph University (USJ) and the American University of Beirut (AUB). In 1973, the Lebanese government signed a sport's cooperation treaty with the USSR to have Soviet coaches train the Lebanese national volleyball team. Lebanon has competed in numerous international volleyball events. In 1952, Israel defeated Lebanon 3-0 and then lost to Lebanon 3-2 in the World Volleyball Championships in Moscow. Beach volleyball is also practiced in Lebanon. Swimming, water skiing, yachting, sailing, scuba diving, and windsurfing are practiced along the Mediterranean coast of Lebanon, especially on that stretch between Beirut and Tripoli. Diving is a popular sport in Lebanon with interesting wrecks to explore. 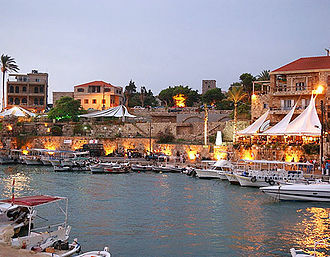 The air temperatures is above 70 °F from May through October, which along with its unexplored waters along the 180 miles coastline, Lebanon has a lot to offer visiting divers. An international water ski championship was held in the Saint George Bay in Beirut, beginning in 1955, but the event was discontinued at the beginning of the war. Since the mid-20th century, weightlifting has been one of the biggest success stories for Lebanese athletes who have participated in numerous international competitions. In the 1972 Summer Olympics in Munich, Mohamed Traboulsi won the silver medal, in addition to many gold medals in continental and regional championships. Lebanon boasts six ski resorts, with slopes suitable for skiers and snowboarders of all ages and levels of experience. Off-slope, there are many opportunities for cross-country skiing, snowshoeing, and snowmobiling. ^ "Olympic Council of Asia to give Beirut a chance to keep 2009 Winter Asian Games - AP Worldstream - HighBeam Research". Web.archive.org. 2 November 2012. Retrieved 15 March 2019. ^ "Welcome to CHL Lebanese Equestrian Club also known as Club Hippique Libanais". Chl-lebanon.com. Retrieved 15 March 2019. ^ "Futsal World Ranking". Futsalworldranking.be. Retrieved 15 March 2019. ^ "Lebanon's Rugby World Cup bid ends with draw - Sports , Rugby - THE DAILY STAR". Dailystar.com.lb. Retrieved 15 March 2019. ^ a b "Member Nations - Federation of International Touch". SportsTG. Retrieved 15 March 2019. ^ Jaoudeh, John Abou. "Lebanese Volleyball". LebVolley.com. Retrieved 15 March 2019. 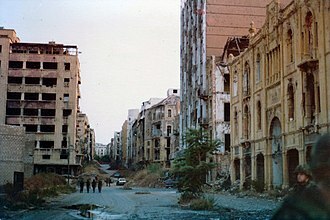 The Beirut Central District or Centre Ville is the name given to Beirut’s historical and geographical core, the “vibrant financial and administrative hub of the country. ”At the heart of Lebanon’s capital, Beirut Central District is an area thousands of years old, traditionally a focus of business, finance and leisure. It is situated on the northern coast and is easily accessible from all parts of the city. This includes the adjacent Beirut Seaport and Rafik Hariri International Airport, major roads converge on it or from boundaries to the east and west, or line its 1.5 km long seafront to the north. Ever since, Beirut Central District has evolved into an integrated business, the Heritage trail is a pedestrian circuit in the citys historic core and the traditional Beirut city center. The trail connects the main sites, places of historic interest, monuments. The Heritage Trail is planned to start and end at the City History Museum on the ancient Tell Area, the trail is divided into four major sections, First Route, The first route in the heritage trail covers the ancient archaeological Tell Area. 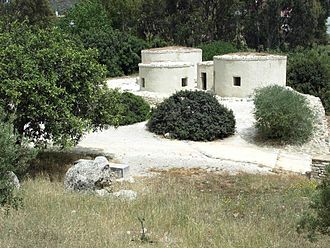 The future site museum will display remains from the Tell area, a sinuous underground path guides visitors through Canaanite, Phoenician-Persian, Roman and Medieval ages. etc. The route will stroll along the streets of Maarad leading up to the Grand Theater historic building and numerous stone churches. Third Route, This segment of the pedestrian circuit revolves largely around the Roman Baths Garden, fourth Route, The fourth route in the Heritage trail lies substantially within the Beirut Souks area. This route contains the Phoenician-Persian quarter, Roman-Byzantine findings, part of the Medieval moat, some mosaics, remains, or arcades will be integrated into the new buildings. Other points of interest along the route are the Zawiyat Ibin Iraq shrine, Majidiyya Mosque, the Shoreline Walk is a proposes sequence of connected spaces which form part of the reconstruction of the Beirut city centre. The city was known for its rocky shoreline Cornice, with its avenues of palms and cafés. 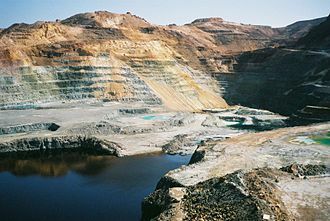 Areas have been preserved and demolished by the new master plan, whilst the remediated landfill is set to become a new district. Rock climbing is an activity in which participants climb up, down or across natural rock formations or artificial rock walls. The goal is to reach the summit of a formation or the endpoint of a usually pre-defined route without falling. 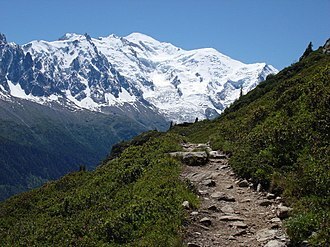 Due to the length and extended endurance required and because accidents are likely to happen on descent than ascent. It is very rare for a climber to downclimb, especially on the larger multiple pitches, professional Rock climbing competitions have the objectives of either completing the route in the quickest possible time or attaining the farthest point on an increasingly difficult route. Scrambling, another activity involving the scaling of hills and similar formations, is similar to rock climbing, rock climbing is generally differentiated by its sustained use of hands to support the climbers weight as well as to provide balance. Rock climbing is a physically and mentally demanding sport, one that often tests a climbers strength, agility and it can be a dangerous activity and knowledge of proper climbing techniques and usage of specialized climbing equipment is crucial for the safe completion of routes. Because of the range and variety of rock formations around the world. Paintings dating from 200 BC show Chinese men rock climbing China woop woop, in early America, the cliff-dwelling Anasazi in the 12th century were thought to be excellent climbers. 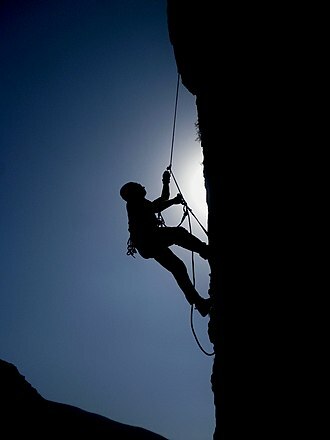 Early European climbers used rock climbing techniques as a required to reach the summit in their mountaineering exploits. In the 1880s, European rock climbing become an independent pursuit outside of mountain climbing, Rock climbing evolved gradually from an alpine necessity to a distinct athletic activity. 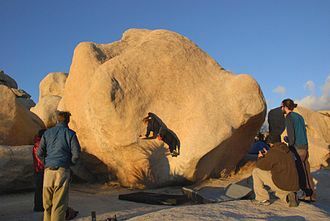 However, climbing techniques and ethical considerations have evolved steadily, free climbing, climbing using holds made entirely of natural rock while using gear solely for protection and not for upward movement, is the most popular form of the sport. Free climbing has since divided into several sub-styles of climbing dependent on belay configuration. Over time, grading systems have created in order to compare more accurately the relative difficulties of the rock climbs. 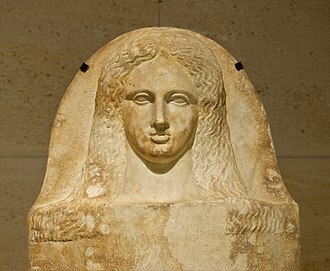 The enterprising, sea-based Phoenician civilization spread across the Mediterranean between 1500 BC and 300 BC. Their civilization was organized in city-states, similar to those of Ancient Greece, perhaps the most notable of which were Tyre, Arvad and Carthage. Each city-state was an independent unit, and it is uncertain to what extent the Phoenicians viewed themselves as a single nationality. In terms of archaeology, language and religion there was little to set the Phoenicians apart as markedly different from other Semitic Canaanites. 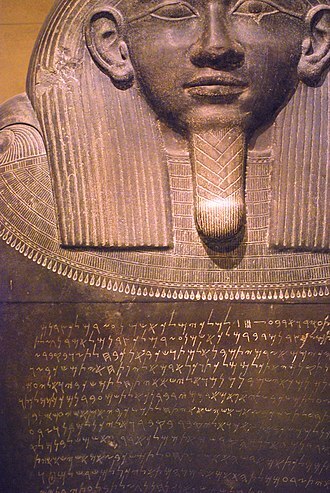 The Phoenicians were the first state-level society to make use of alphabets. By their maritime trade, the Phoenicians spread the use of the alphabet to Anatolia, North Africa, and Europe, where it was adopted by the Greeks, the name Phoenicians, like Latin Poenī, comes from Greek Φοίνικες. The word φοῖνιξ phoînix meant variably Phoenician person, Tyrian purple, the word may be derived from φοινός phoinós blood red, itself possibly related to φόνος phónos murder. Beekes has suggested a Pre-Greek origin of the ethnonym, the oldest attested form of the word in Greek may be the Mycenaean po-ni-ki-jo, po-ni-ki, possibly borrowed from Ancient Egyptian fnḫw Asiatics, although this derivation is disputed. 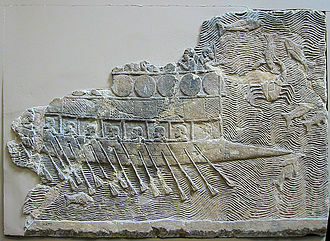 The folk-etymological association of Φοινίκη with φοῖνιξ mirrors that in Akkadian which tied kinaḫni, the land was natively known as knʿn and its people as the knʿny. In the Amarna tablets of the 14th century BC, people from the region called themselves Kenaani or Kinaani, the ethnonym survived in North Africa until the 4th century AD. Herodotus account refers to the myths of Io and Europa, according to the Persians best informed in history, the Phoenicians began the quarrel. The Greek historian Strabo believed that the Phoenicians originated from Bahrain, Herodotus believed that the homeland of the Phoenicians was Bahrain. 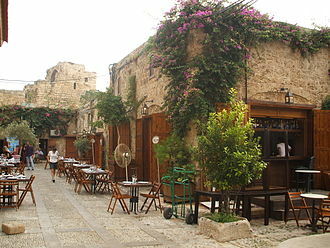 The people of Tyre in South Lebanon in particular have long maintained Persian Gulf origins, there is little evidence of occupation at all in Bahrain during the time when such migration had supposedly taken place. A1 Grand Prix was a single make open wheel auto racing series. 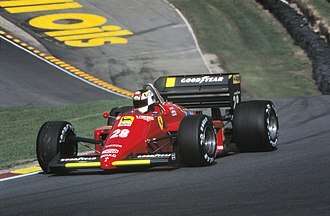 It was unique in its field in that competitors solely represented their nation as opposed to themselves or a team, as such, it was often promoted as the World Cup of Motorsport. The series was ratified by the Fédération Internationale de lAutomobile and races were held in the traditional Formula One off-season, the nation-based A1GP concept was founded by Sheikh Maktoum Hasher Maktoum Al Maktoum of Dubai, initially in 2003. After a successful first season of A1GP, it was announced on 29 September 2006 that Maktoum was to sell his position as Chairman & Director of A1GP, the transfer of his share in the organisation of A1 Grand Prix to RAB Capital was finalized in December 2006. Tony Teixeira took control of the series in 2006, leading it to liquidation by 2009, the nation-based A1GP concept was founded by Sheikh Maktoum Hasher Maktoum Al Maktoum of Dubai, initially in 2003. Thirty franchises were made available, twenty-three of them were restricted to specified nations, the first season was planned for 12 rounds, however the cancellation of a race scheduled for Curitiba, Brazil in January 2006 reduced this number to 11. Nelson Piquet, Jr. won the race of the series for A1 Team Brazil. Their winning form was not to continue, wins at Estoril and Malaysia saw A1 Team France build up a sizeable gap. By the start of the break, France had run away with the lead with A1 Team Switzerland 28 points behind. At the final race of the season in Shanghai, A1 Team France were crowned the first-ever A1 Grand Prix world champions with 172 points, Switzerland were second with 121 points and A1 Team Great Britain third with 97 points. Katherine Legge was the first woman to drive A1 Grand Prix cars during test session in December 2005 on Dubai Autodrome, changes were made for the 2006–07 season to race durations and distances to improve the spectacle for attendees and TV viewers. The 2006–07 schedule was released on 7 July 2006, with the first race at Circuit Park Zandvoort on 1 October 2006, New teams Team Singapore and Team Greece joined the competition but Team Turkey failed to secure funding for the season. Team Austria, Team Japan, Team Portugal and Team Russia did not return for the second season, after securing funding Team Portugal competed in the final four rounds of the second season in South Africa, Mexico and Britain. 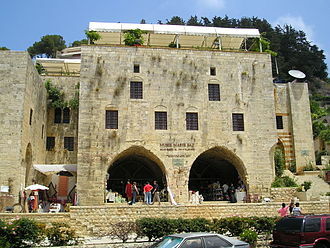 Tripoli is the largest city in northern Lebanon and the second-largest city in the country. Situated 85 kilometers north of the capital Beirut, it is the capital of the North Governorate, Tripoli overlooks the eastern Mediterranean Sea, and it is the northernmost seaport in Lebanon. It holds a string of four small islands offshore, and they are the islands in Lebanon. The Palm Islands were declared an area because of their status of haven for endangered loggerhead turtles, rare monk seals. Tripoli borders the city of El Mina, the port of the Tripoli District, Tripoli had a number of different names as far back as the Phoenician age. In the Amarna letters the name Derbly, possibly a Semitic cognate of the citys modern Arabic name Ṭarābulus, was mentioned, in an engraving concerning the invasion of Tripoli by the Assyrian King Ashurnasirpal II, it is called Mahallata or Mahlata and Kayza. Under the Phoenicians, the name Athar was used to refer to Tripoli, when the Ancient Greeks settled in the city they called it Τρίπολις, meaning three cities, influenced by the earlier phonetically similar but etymologically unrelated name Derbly. The Arabs called it Ṭarābulus and Ṭarābulus al-Šām, Tripoli is known as al-fayḥā′, which is a term derived from the Arabic verb faha which is used to indicate the diffusion of a scent or smell. Tripoli was once known for its vast orange orchards, during the season of blooming, the pollen of orange flowers was said to be carried on the air, creating a splendid perfume which filled the city and suburbs. Tripoli has a Mediterranean Climate with mild winters and moderately hot summers, temperatures are moderated throughout the year due to the warm Mediterranean Current coming from Western Europe. Therefore, temperatures are warmer in the winter by around 10 °C, although snow is an extremely rare event that only occurs around once every 5 years and sleet are very common and occur fairly regularly in the winter. Rainfall is concentrated in the months, with the summer typically being very dry. There is evidence of settlement in Tripoli that dates back as early as 1400 BCE, under Hellenistic rule, Tripoli was used as a naval shipyard and the city enjoyed a period of autonomy. Beach volleyball is a team sport played by two teams of two players on a sand court divided by a net. It has been an Olympic discipline since the 1996 Games, as in indoor volleyball, the object of the game is to send the ball over the net and to ground it on the opponents court, and to prevent the same effort by the opponent. A team is allowed up to three touches to return the ball across the net, the ball is put in play with a serve — a hit by the server from behind the rear court boundary over the net to the opponents. The rally continues until the ball is grounded on the court, goes out. The team winning a rally scores a point and serves to start the following rally, the four players serve in the same sequence throughout the match, changing server each time a rally is won by the receiving team. Beach volleyball originated at the Outrigger Canoe Club, on the shores of Waikiki Beach, the true birth of beach volleyball apparently began on the beaches of Waikiki Beach in Hawaii, at the Outrigger Canoe Club in 1915. From the moment that this first recorded game in Hawaii took place, the Outrigger Canoe Club was founded in 1908 by a small group of Honolulu’s business and professional community. The Club’s original mission was to help perpetuate traditional Hawaiian sports and they began so that they could make sure the native and small-boy could doff their duds and mount their surf boards at will as they enjoyed the waves of Waikiki. It became a place where man could commune with the sun, the sand and the sea, along with good fellowship, the Club’s story mirrors that of Waikiki and Hawaii. The 1908 clubhouse was two grass houses purchased from a defunct zoo, the grass houses were moved to leased land, on the beach, next to a lagoon. One was fitted out as a shed for canoes and surfboards, the other shed became the Club’s first bathhouse and dressing room. A sand floor pavilion was built a time and it became a popular gathering place for members. 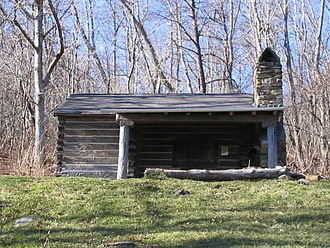 A new clubhouse was built in 1941 on the same grounds. Then in 1964, when the Waikiki lease was lost, the moved to its present Diamond Head location. Caving — traditionally known as spelunking in the United States and Canada and potholing in the United Kingdom and Ireland — is the recreational pastime of exploring wild cave systems. In contrast, speleology is the study of caves and the cave environment. Cave diving is a distinct, and more hazardous, sub-speciality undertaken by a minority of technically proficient cavers. Sometimes categorized as a sport, it is not commonly considered as such by long-time enthusiasts. Many caving skills overlap with those involved in canyoning, Caving is often undertaken for the enjoyment of the outdoor activity or for physical exercise, as well as original exploration, similar to mountaineering or diving. Physical or biological science is an important goal for some cavers, virgin cave systems comprise some of the last unexplored regions on Earth and much effort is put into trying to locate and survey them. In well-explored regions, the most accessible caves have already been explored, Caving, in certain areas, has been utilized as a form of eco and adventure tourism. Tour companies have established a leading and guiding tours into. Depending on the type of cave and the type of tour, in many areas, there are tours led through lava tubes by a guiding service. Some however consider the assistance cavers give each other as a team sport activity. Too much emphasis on the labeling of caving as a sport can narrow the goals of caving as a whole, Caving often puts the needs and welfare of a cave before those of the active participants. Clay Perry, an American caver of the 1940s, wrote about a group of men and this group referred to themselves as spelunkers, a term derived from the Latin spēlunca cave, den, itself from the Greek σπῆλυγξ spēlynks cave. This is regarded as the first use of the word in the Americas, throughout the 1950s, spelunking was the general term used for exploring caves in US English. It was used freely, without any positive or negative connotations, in the 1960s, the terms spelunking and spelunker began to be considered déclassé among experienced enthusiasts. Bodybuilding is the use of progressive resistance exercise to control and develop ones musculature. An individual who engages in this activity is referred to as a bodybuilder, the winner of the annual IFBB Mr. Olympia contest is generally recognized as the worlds top male professional bodybuilder. The title is held by Phil Heath, who has won every year from 2011 to 2016. The winner of the Womens Physique portion of the competition is widely regarded as the top female professional bodybuilder. The title is held by Juliana Malacarne, who has won every year since 2014. Since 1950, the NABBA Universe Championships have been considered the top amateur bodybuilding contests, with notable winners such as Reg Park, Lee Priest, Steve Reeves, stone-lifting traditions were practised in ancient Egypt and Greece. Western weightlifting developed in Europe from 1880 to 1953, with strongmen displaying feats of strength for the public, the focus was not on their physique, and they often had large bellies and fatty limbs. Bodybuilding developed in the late 19th century, promoted in England by German Eugen Sandow, now called the Father of Modern Bodybuilding and he allowed audiences to enjoy viewing his physique in muscle display performances. Although audiences were thrilled to see a well-developed physique, the men simply displayed their bodies as part of demonstrations or wrestling matches. Sandow had a stage show built around these displays through his manager, the Oscar-winning 1936 musical film The Great Ziegfeld depicts this beginning of modern bodybuilding, when Sandow began to display his body for carnivals. Sandow was so successful at flexing and posing his physique that he created several businesses around his fame. He was credited with inventing and selling the first exercise equipment for the masses, machined dumbbells, spring pulleys, even his image was sold by the thousands in cabinet cards and other prints. Sandow was a perfect gracilian, a standard of ideal body proportions close to those of ancient Greek, men were judged by how closely they matched these proportions. Swimming is an individual or team sport that involves using arms and legs to move the body through water. Typically, the takes place in pools or in open-water. Competitive swimming is one of the most popular Olympic sports, with events in butterfly, breaststroke, freestyle, in addition to these individual events, swimmers take part in relays. Swimming each stroke requires specific techniques, and in competition, there are specific regulations concerning the form for different strokes. There are put in place to regulate what types of swimsuits are allowed at competitions. Although it is possible for competitive swimmers to incur several injuries from the sport, evidence of recreational swimming in prehistoric times has been found, with the earliest evidence dating to Stone Age paintings from around 10000 years ago. Written references date from 2000 BC, with some of the earliest references to swimming including the Iliad, the Odyssey, the Bible, the Quran and others. In 1538, Nikolaus Wynmann, a German professor of languages, wrote the first swimming book, Swimming emerged as a competitive recreational activity in the 1830s in England. In 1828, the first indoor swimming pool, St Georges Baths was opened to the public, by 1837, the National Swimming Society was holding regular swimming competitions in six artificial swimming pools, built around London. In 1844 two Native American participants at a competition in London introduced the front crawl to a European audience. Sir John Arthur Trudgen picked up the stroke from some South American natives and successfully debuted the new stroke in 1873. His stroke is still regarded as the most powerful to use today, captain Matthew Webb was the first man to swim the English Channel, in 1875. Using the breaststroke technique, he swam the channel 21.26 miles in 21 hours and 45 minutes and his feat was not replicated or surpassed for the next 36 years, until T. W. Burgess made the crossing in 1911. Other European countries established swimming federations, Germany in 1882, France in 1890, the first European amateur swimming competitions were in 1889 in Vienna. The worlds first womens swimming championship was held in Scotland in 1892, mens swimming became part of the first modern Olympic Games in 1896 in Athens. Lebanese Brazilians are Brazilian people of full, partial, or predominantly Lebanese ancestry, or Lebanese-born immigrants in Brazil. Until 1922, Levantine immigrants were considered Turks, as they carried passports issued by the Turkish Ottoman Empire, the population of Brazil of either full or partial Lebanese descent is estimated by the Brazilian and Lebanese governments to be around 7 million people. If the first figure is correct, this number of descendants is larger than the population in Lebanon, Immigration of the Lebanese to Brazil started in the late 19th century, most of them coming from Lebanon and from Syria. 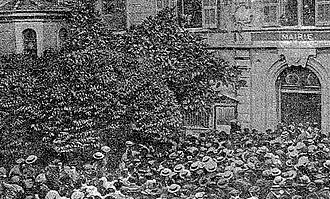 The immigration to Brazil grew further in the 20th century, and was concentrated in the state of São Paulo, between 1884-1933130,000 Lebanese people immigrated to Brazil. 65% of them were Catholics, 20% were Eastern Orthodox and 15% were Muslims, during the Lebanese Civil War 32,000 Lebanese people immigrated to Brazil. Although the exact number of Lebanese Brazilians is disputed it is clear there are at least 6 million Brazilians of Lebanese origin. Public beach volleyball courts in Santa Monica, where the modern two-man version originated. The routes taken by Webb and T.W. Burgess across the English Channel, in 1875 and 1911, respectively. Katie Ledecky set the Olympic records in 2016 for the 400 m and 800 m freestyle. A1 Team Pakistan and their seat holder Adam Khan during a pit stop. Eugen Sandow, often referred to as the "Father of Modern Bodybuilding"
A men's cross country competition with a large leading pack in Minnesota, United States. Runners at the 2010 European Cross Country Championships in Portugal. Climbing in Germany, circa 1965. Note the lack of intermediate protection points and the potentially unsafe tie-in method, which demonstrate the maxim of the day: "The leader must not fall". Caving in a muddy section of Black Chasm Cave in California. Stephens Gap, a vertical cave in Alabama. Caver in an Alabama cave showing common caving wear: coveralls, helmet-mounted lights, heavy boots and gloves. One of the caves in the Qadisha Valley. The monastery of Mar Elisha is perched on the cliff. 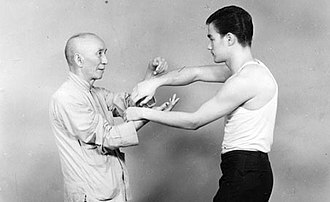 In Greco-Roman wrestling, the prohibition on the use of the legs in offense and defense often means that points are scored for many throws of grand amplitude. Lifting skills are essential, as seen here.